“The yellow vests movement ….. is a protest movement which began with demonstrations in France on Saturday, 17 November 2018 and subsequently spread to nearby countries (e.g. Italy , Belgium and the Netherlands. Galvanized by rising fuel prices, the high cost of living, and claims that a disproportionate burden of the government’s tax reforms were falling on the working and middle classes (especially those in rural and peri-urban areas), protesters called for the end of such changes and the resignation of the President of France, Emmanuel Macron. Because the horoscope shown here has no exact time no houses or the Part of Fortune are shown and the Moon’s range is set for daylight hours. The protests most likely began in the morning or early afternoon at the latest. The Sun in Scorpio suggests deeply held and intense feelings. The Moon in Pisces, another water sign, builds on this picture of a strong emotional reaction. While I don’t have an exact time of birth, it is likely that the Moon is conjunct Neptune, the planet of confusion, deception and disillusionment, and in square aspect with Mercury, the planet of communication and transport. The movement has no recognized leader although it initially began as a truck driver protest organised on Facebook. Mars in Pisces rules the Sun and dominates the picture with a square aspect to a very strong Jupiter in Sagittarius. The Mars-Jupiter connection tends to exaggerate anger and in Pisces Mars is in protest against feeling victimized. Jupiter in Sagittarius provides a ready vehicle to promote the message far and wide. Venus in Libra is strong in its own sign and opposes Uranus, the planet associated with protest and rebellion. Venus in Libra represents a preference for peace and agreement, but the opposition to Uranus makes diplomatic solutions very difficult and creates a boil-over situation. The Sun and Saturn, the two planets representing leadership and authority, are un-aspected, reflecting the amorphous nature of the Yellow Vests Movement. The horoscope for Peter Dutton shows the Sun Jupiter and Venus in Scorpio. At the time of writing he has just thrown his hat into the ring for leadership of the Liberal party, and came up short, and resigned from the ministry. However it is generally reported by the media that another challenge is inevitable, and the fate of the prime Minister, Malcolm Turnbull, is doomed. So will Peter Dutton be successful at a second (or third) challenge, and if so, when? I have no accurate birth time for his natal horoscope, so no houses or the Part of Fortune are shown. The Moon sits somewhere between 17-30 Cancer. The Thema Mundi horoscope layout is used so as not to suggest house placements. There are a number of outstanding features of this horoscope. One is the Jupiter Sun conjunction, generally an indicator of success and a fortunate life. The Moon trines the Sun by sign, showing that ‘the lights’ are in harmony, which is another positive indicator. A third important planetary indicator is the Jupiter Saturn opposition, showing an internal struggle about when to expand and when to retreat and consolidate. However strong connections between these two planets have often been observed in the horoscopes of successful business people. Peter Dutton’s worth is reported to exceed 200 million. At the time of the challenge transiting Jupiter was at the midpoint of his natal benefics, Venus and Jupiter. Pluto was trining natal Saturn and squaring natal Mars. The latter aspect shows the difficult diplomacy at play, while Pluto’s trine to Saturn adds power and control. Transiting Jupiter is generally an indicator of success. During the first two weeks of September Jupiter will conjoin Jupiter. This is called the Jupiter return and takes place every twelve years. Depending on the context of one’s life it can indicate a new phase of expansion and optimistic outreach. The Jupiter return period would be an ideal time for Peter Dutton to make a second challenge. Transiting Jupiter conjoins the natal Sun around mid October 2018. This aspect is also considered to be very fortunate. The lead up to this conjunction in mid October is a very positive time for Peter Dutton. Will he win the leadership vote if he makes another challenge? You bet he will! Unless of course someone with a better horoscope comes along. Scott Morrison (born 13 May 1968) is rumoured to be considering a tilt at the PM’s job, but Pluto is making a square aspect to his natal Saturn, which is an indication of serious and intense challenges; rarely seen as positive. However his natal Sun is at 22 Taurus, receiving a trine from Pluto and soon a sextile from Jupiter. These are both positive indicators to counter-balance the negative Pluto transit to Pluto. Julie Bishop (born 17 July 1956) has the Sun at 24 Cancer trine Saturn at 26 Scorpio. These planets benefit from the same Jupiter aspects that are working for Peter Dutton. She is also in a positive phase and may somehow benefit from the political machinations going on behind the scenes. At the time of writing she is backing Turnbull so perhaps there are unexpected developments ahead. Alternatively she may seek an escape from politics. Escapism and freedom-seeking are alternative interpretations for Jupiter transits. Malcolm Turnbull (born 24 October 1954) has natal Jupiter at 28 Scorpio, and will be having a Jupiter trine around the end of October / start of November. Often Jupiter aspects are associated with a holiday; having a good time, which in the present circumstances, may be his best option should he lose a leadership challenge. This point also brings us back to Peter Dutton. It is possible that he won’t challenge again and simply go away on a holiday. Possible but not likely. However if he doesn’t challenge before mid October and leaves it to the end of October, Malcolm Turnbull’s positive Jupiter transits at that time might yet see him prevail. Without accurate birth times the astrologer is challenged. However unless something very unusual takes place, it looks like Peter Dutton is about to become the 30th Prime Minister of Australia. However watch for Julie Bishop; she also has excellent transits, as does Scott Morrison. Will the media forecast be correct? https://westernastrology.net/wp-content/uploads/Joy-ogo-300x300.png 0 0 Peter Burns https://westernastrology.net/wp-content/uploads/Joy-ogo-300x300.png Peter Burns2018-08-22 10:09:152018-08-24 03:15:56Peter Dutton for PM? On March 11 2018 Xi Jinping became President of China for life after constitutional changes were passed by the annual sitting of parliament, the National People’s Congress, which approved the removal of the two-term limit on the presidency. The vote was widely regarded as a rubber-stamping exercise. Because Xi’s birth time is unknown the Moon’s range is shown for its 24 hour passage on 15 June 1953. Neither are houses or the Part of Fortune shown, as these require an accurate birth time. Like Trump, Xi Jingping has the Sun in Gemini. Their natal Suns are almost exactly conjunct, within one or two degrees. A very interesting coincidence. 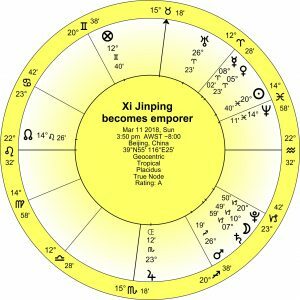 The Sun in Gemini suggests that there are two sides to Xi Jingping. Gemini is associated with agility, curiosity, and mental dexterity. In Xi Jingping’s horoscope the Sun is ruled by Mercury in Cancer, conjunct Uranus, showing a very quick and intuitive mind. His Leo Moon offers warmth, charisma and a need to be the centre of attention. It also hints at the desire to lead, to dominate. Venus is in antiscia relationship with Xi’s natal Pluto, suggesting a hidden desire to dominate. Xi Jingping’s natal Sun aspects Pluto in Leo, showing intensity, ruthlessness and the desire to dominate. It also aspects the Saturn-Neptune conjunction in Libra. Saturn is also about control and power, and together with Neptune in Libra he achieves goals with poise, balance and good judgement. Neptune adds sensitivity and refinement, and also the capacity for deception and the use subtlety in presentation. Pluto in Xi’s horoscope sits at the midpoint between the Sun and Saturn/Neptune. When this horoscope is progressed his natal Sun is at 25 degrees of Leo, which suggests an important life change in about 5 years time when it moves into Virgo. It is possible that he ceases to be President in 5 years time. The horoscope for his ascension to presidency for life (becoming emperor of China) is taken from various news reports. Some say 3:45 pm and some 3:50 pm. I believe this horoscope is close to an exact time. The ascendant ruler the Sun, which also symbolizes leadership and power, aspects Pluto, suggesting an unconscious desire to dominate. This aspect echoes his own natal chart where the Sun also aspects Pluto by sextile. The Sun next aspects Jupiter, the planet of expansion. The Moon trines the Midheaven, the place associated the highest authority. In Capricorn the Moon is cautious and well organised. It is ruled by a powerful Saturn, which in mundane (political) astrology represents law enforcement. The ascendant for his ascension to presidency for life conjoins Pluto in Xi’s horoscope. As mentioned above his Pluto sits at the midpoint between his Sun and Saturn/Neptune. And the Uranus-Mars trine in the ascension horoscope trines Xi’s natal Pluto. Jupiter, the planet of expansion, also links with his Pluto. 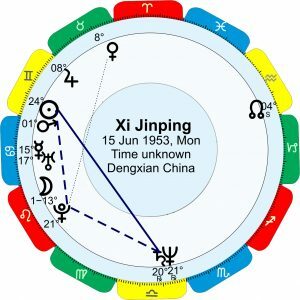 Even without a time of birth for Xi Jingping we can see that the horoscope for his ascension to presidency for life links remarkably to his natal Pluto, which represents the unconscious drive to dominate and control. And when we check the horoscope for China, is there a link the degree of natal Pluto in Xi Jingping’s horoscope? You can bet there is. But that’s a story for the next article. Back in August I wrote about Australia Deputy leader Barnaby Joyce’s horoscope and whether it indicated he might have dual citizenship and therefore would need to step down from parliament. I have no birth time so I used the thema mundi chart set for noon, shown here without houses, with the Moon’s movement on his birthday between 10-23 of Cancer. The solar eclipse of August 21 2017 aspected his Sun with an orb of 2-3 degrees, the maximum orb allowable, highlighting his natal Sun, arguably one of the most important points in any horoscope. Solar eclipses are associated with unexpected surprises where hidden lunar forces are released and the situation changes very quickly. I checked the Aries ingress of the Sun for Australia and saw that the solar eclipse of August 17 conjoined the 11th cusp. The 10th house represents the government and the Prime Minister (PM). The 11th house, as the derived 2nd house from the 10th house, represents the support for the PM, and as Barnaby Joyce is Australia’s deputy PM, Barnaby is represented by the 11th house. The 11th house cusp is closely aspected by the Moon, which represents the high court, and Saturn which rules the opposition because it rules the sign opposite to the government’s 10th house. I said it didn’t not look good for Barnaby Joyce and “it is most likely that Barnaby Joyce will be forced to stand down“. He was forced to stand down, had to compete in a by-election, and was re-elected. Note his Sun-Mars opposition. he is a fighter. Not that Mars is in great condition in Libra but he knows how to relate to people and anticipate others’ reactions. Fast forward to the present and the partial solar eclipse of February 15-16 again aspects his natal Sun. Again he is serious trouble, this time because of an affair and it’s reflection on his support of traditional family values. His reputation has in a sense been partially eclipsed. On the left is Barnaby Joyce’s horoscope with the Feb 2018 partial solar eclipse added. Again both his natal Sun and Mars are activated. 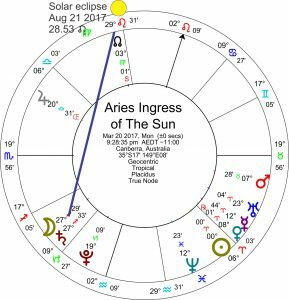 It is interesting that the Feb 2018 eclipse sits on the fifth house cusp of the 2017 Aries Ingress of the Sun horoscope for Australia. Tanya Plibersek is Labor’s deputy leader, and has entered the debate on Joyce’s affair on a different note, declaring that what he does with his personal life should remain private, but that his use of taxpayer funds in moving Vikki Campion, the staffer he had an affair with, into different jobs, should be made fully transparent. Barnaby Joyce’s horoscope also shows his natal Saturn at 5 Aries, which means transiting Saturn is squaring his natal Saturn. Saturn aspects bring a test and the need to face facts, and are often associated with issues of maturity, failure, the need to face reality, the need to take responsibility for something, and frequently career issues and for older folk, questions about retirement. He is now needing to run two families and is said to need to keep his job to pay for his various expenses. No doubt he will fight hard to resist retirement from public office. In more recent news it is claimed in the media that a crisis has developed between the governing parties because of comments made by the PM Malcolm Turnbull and the backlash from Barnaby Joyce. 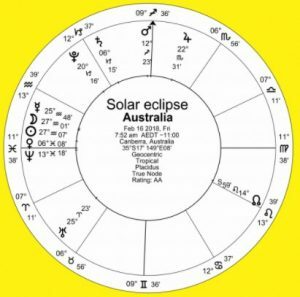 In the horoscope shown on the left for the Feb 15-16 2018 partial solar eclipse for Australia the aggravation for the government is shown by Mars conjunct the Midheaven. 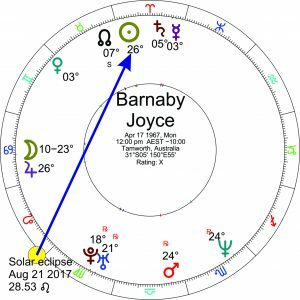 The government and its leader Malcolm Turnbull are shown by the tenth house ruler Jupiter, which is square the eclipse at 22 Scorpio. Turnbull is in a difficult position. The deputy leader, Barnaby Joyce, is shown by the eleventh house ruler which is Saturn in Capricorn. Venus, the planet representing relationships and young women, aspects Saturn by applying sextile within 7 minutes of arc, which is descriptive of the deputy leader’s affair with his staffer. The eclipse itself falls in the twelfth house of matters hidden, of entrapment, and self-undoing. Neptune, the planet of illusion and deception, is just within the first house, in tight square aspect with Mars on the Midheaven. The horoscope for the solar eclipse describes the situation in Australia very well and shows government leadership in crisis. The ascendant ruler is the Sun in Capricorn. Therefore the Sun represents Bitcoin. The Sun’s zodiacal position is exactly opposite the Sun in the horoscope for the USA (using the Sibly chart), suggesting that it may oppose US interests. The Sun first aspects Uranus, suggesting a volatile nature, and then Saturn, which suggests the opposite: a conservative and predictable nature. The Sun is conjunct the fixed star Ascella. This conjunction is associated with good fortune and lasting happiness. [Robson, p.141. ], and is of the nature of Jupiter and Mercury. Jupiter is debilitated in this horoscope, in it’s detriment. However Mercury is especially powerful as it sits astride the seventh house cusp. 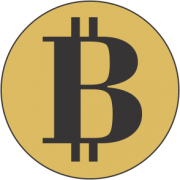 The seventh house represents the people who use Bitcoin. There are three planets at 29 degrees: the Moon, Venus and Jupiter. Venus, ruler of the eleventh house and the fourth house, is at the midpoint of the Moon and Jupiter. 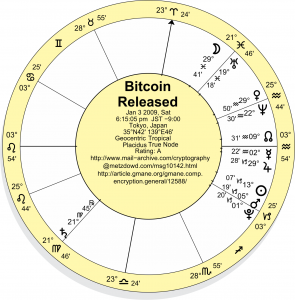 For the purpose of prediction to assist those considering investing in Bitcoin, the history of Bitcoin is well documented and this chart can be correlated with Bitcoin events. I have not had time to do this research and look forward to hearing from anyone who has time to research this project. One event worth considering is when SegWit was activated problems on August 24th, 2017, which has been described as a huge day for the Bitcoin and blockchain industry. 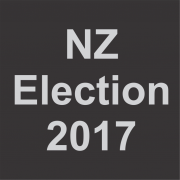 class=”alignleft size-medium wp-image-237″ src=”https://westernastrology.net/wp-content/uploads/NZ-2017-Election-300×300.png” alt=”NZ 2017 Election” width=”300″ height=”300″ />One of the oldest, and in my experience most effective ways to predict the outcome of a national political election is to use the horoscope for the ingress of the Sun, set for the nation’s capital. The 2017 ingress chart is explored here to assess whether it accurately predicts the outcome of the NZ Election. The ingress chart for the NZ Election is set for the current astrological year, which begins when the Sun’s apparent path crosses the equator at the Aries equinox, usually on March 20 2017, and the location is the nation’s capital: Wellington. The incumbent government, the centre-right national party led by Bill English, is shown by the ruler of the 10th house and the opposition is shown by the ruler of the 4th house. The outcome is assessed by examining the condition of these two rulers: their essential and accidental dignities, planets in the 10th and 4th houses, and aspects to these rulers. An important consideration is the next aspect of the Moon. The Moon is generally used to represent the common people, the voters, although the ruler of the 1st house can also be used for this purpose. In this horoscope the Moon applies to the ruler of the 4th house, Saturn, with 4 minutes of arc. By itself this is almost sufficient to indicate that the opposition wins the election. It should be pointed out that the Moon was applying to Saturn everywhere in the world in each nation’s ingress chart. The difference here is that Saturn rules the 4th house cusp, and does not do so in most other countries. The other difference is context: not every country is holding an election in this astrological year. Another factor favouring the opposition is that the 4th house ruler is located in the 1st house of the people. The Moon is also in the people’s house applying to Saturn. Also we see Jupiter, the ruler of the 1st house, in the sign of Saturn’s exaltation: the people like what the opposition has to offer. In the government’s favour the Moon’s north node, which represents gain, is located in the 10th house of government, although it’s in a different sign than the one on the Midheaven, which lessens its potency. The ruler of the 10th house, the Sun, is in the sign of its exaltation, which is an essential dignity showing strength. This compares well with the essential dignity of the opposition’s ruling planet Saturn, which is peregrine, a minor weakness. The Sun however is not well placed at the cusp of the 5th house. Here it is unable to ‘see’ the Midheaven, and has little strength. Compare this with the 4th house ruler representing the opposition which is in a powerful angular house. With news that Barnaby Joyce may have dual citizenship and therefore may have to step down from parliament I decided to have a look at his horoscope. I have no birth time so I have used the thema mundi chart which is set for noon and shown here without houses and the Moon’s movement through his birthday is between 10-23 of Cancer. The solar eclipse of August 21 2017 aspects his Sun with an orb of 2-3 degrees. 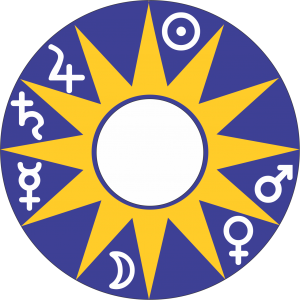 While this might be considered to be the maximum orb allowable it does highlight his natal Sun, arguably one of the most important points in any horoscope. 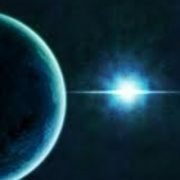 Solar eclipses are associated with unexpected surprises where hidden forces are released and the situation changes very quickly. In the context of Barnaby’s position as deputy leader of Australia and the challenger to his right to hold that position this eclipse suggests that his tenure is under serious threat. Checking on the Aries ingress of the Sun for Australia we see that the solar eclipse of August 17 conjoins the 11th cusp. The 10th house represents the government and in particular the Prime Minister (PM). The 11th house, as the derived 2nd house from the 10th house, represents the support for the PM. The deputy PM is the PM’s most primary support and is represented by the 11th house. The 11th house also represents the Liberal and National Party MPs whose votes the PM relies upon to form government. The 11th house cusp is closely aspected by the Moon and Saturn. Saturn rules the opposition because it rules the sign opposite to the government’s 10th house, and the Moon as 9th house ruler represents the high court. It does not look good for the government or for Barnaby Joyce. 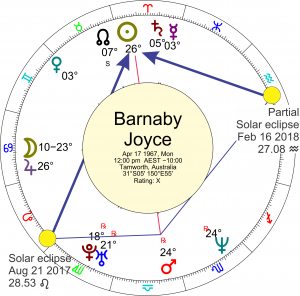 Based on the relationship between the solar eclipse with Barnaby Joyce’s horoscope and the 2017 Aries Ingress horoscope for Australia it is most likely that Barnaby Joyce will be forced to stand down. This function has been disabled for Western Astrology .